October 28, 2012 - Make sure you like EcoJoes on Facebook to stay updated on green ways to save money and help the environment. Just click the "like" button below. Muchas gracias! Do you put off flushing your old-timey toilet, dreading the inevitable waste of water as gallons and gallons of good clean water are used by your old, inefficient terlet? But buying a new, high efficiency toilet just seems out of your budget? Amigo, I think I have the solution. If you live in Durham, North Carolina, keep on reading. If not, contact your local municipality or city and see if they have a similar program. 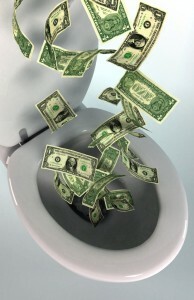 The City o’ Durham is running a Toilet Rebate Program, wherein they’ll give you a $100 credit for every old, inefficienct toilet that you replace with a WaterSense-approved, high-efficiency toilet. The new toilet must use 1.28 gallons per flush at most, and has to be on this here EPA high efficiency toilet list. I ended up buying 3 Project Source high efficiency toilets from good ol’ Lowes, and although they weren’t listed on the EPA list, I spoke with someone from Durham Department of Water Management, and he told me that they’d add that toilet brand to the approved list soon. So now I have 3 low-flow toilets that’ll save money and cut water use for years to come. Also, I actually made money buying these toilets! Total cost to me $264-$300 -$36! Cha-ching! I suggest you take part in the Durham toilet rebate program before it’s too late! Save water, save money, that’s the power of EcoJoes. Posted in save money, water	on Sunday, October 28th, 2012 at 4:59 PM.